1 Tobacco smoke contains tar, carbon monoxide and nicotine. 2 Tar settles on the epithelium lining the bronchi and bronchioles and stimulates inflammation, an increase in the secretion of mucus and an accumulation of phagocytes from the blood. 3 Damage to the airways and alveoli occurs in chronic obstructive pulmonary disease (COPD). In chronic bronchitis, the airways are obstructed by mucus and infection; in emphysema, alveoli are destroyed, reducing the surface area for gas exchange. 4 Tar contains carcinogens, which cause changes in DNA in bronchial epithelial cells, leading to the development of a bronchial carcinoma. This is lung cancer. 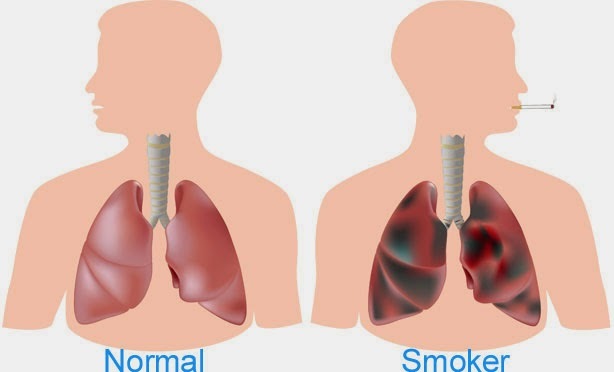 5 Some of the signs and symptoms of COPD are breathlessness, wheezing and constant coughing; two of the symptoms of lung cancer are coughing up blood and chest pains. 6 Carbon monoxide combines irreversibly with haemoglobin, reducing the oxygen-carrying capacity of the blood. 7 Nicotine stimulates the nervous system, increasing heart rate and blood pressure, and stimulating vasoconstriction, which reduces blood fl ow to the extremities. 8 Epidemiological evidence shows a strong correlation between smoking and lung diseases such as cancer; the link between smoking and lung cancer was confi rmed by experimental studies. 9 Smoking damages the cardiovascular system, increasing atherosclerosis and increasing the risk of coronary heart disease and stroke. 10 Atherosclerosis is the development of fatty tissue within the walls of arteries. Th e fatty material, known as atheroma, forms plaques within the artery walls. These roughen the lining of arteries, which may lead to thrombosis (blood clotting). hearts, so very few are performed. depend on people being willing and able to change their lifestyle. 1 Tar in cigarette smoke contains carcinogens and is mostly deposited in the bronchi. What is the effect of these carcinogens? 2 Which component of tobacco smoke binds with haemoglobin to form carboxyhaemoglobin? 3 What is not a symptom of emphysema? A X has bronchitis and Y has emphysema. B X has emphysema and Y has chronic obstructive pulmonary disease. C X has chronic obstructive pulmonary disease and Y has lung cancer. D X has lung cancer and Y has bronchitis. 5 Both carbon monoxide and nicotine are absorbed into the blood from tobacco smoke. What describes their effects on the body? 6 What is the sequence of events leading to atherosclerosis? 7 Which of the following explains the increased risk of stroke, caused by smoking tobacco? A CO increases the blood pressure and increases the chance of a blood vessel in the brain bursting. B Carcinogens increase the blood pressure and increase the chance of a blood vessel in the brain bursting. C Nicotine increases the chance of a blood clot blocking a blood vessel in the brain. D Tars increase the chance of a blood clot blocking a blood vessel in the brain. 8 Which observation is experimental evidence that smoking tobacco causes lung cancer? A Most people who develop cancer are smokers. B Death rates from lung cancer are highest in people who smoke more than 25 cigarettes per day. C Lung cancer was a rare disease until smoking became common in the 20th century. D When substances extracted from tar in cigarette smoke were painted onto the skin of mice, the mice developed tumours. 9 Which dietary factors increase the risk of coronary heart disease? 10 What would not form part of an effective screening programme for CHD? 1 Which of the following substances in tobacco smoke damage the gas exchange system? 2 What are the symptoms of lung cancer? 3 Which substance in tobacco smoke decreases the oxygen-carrying capacity of haemoglobin? 4. Which of the following is an example of an epidemiological investigation? 5. Cigarettesmoke contains tar, nicotine and carbon monoxide. a Describe the effect of tar on the lining of the bronchi in the lungs. b Describe the effects of nicotine and carbon monoxide on the cardiovascular system. 1 a non-smoker (x 200) and 2 a smoker (x 50). b Smokers with lungs similar to the lungs shown in photomicrograph 2 have poor health. 7 a A person is diagnosed as having lungcancer. Describe how the lungcancer developed. 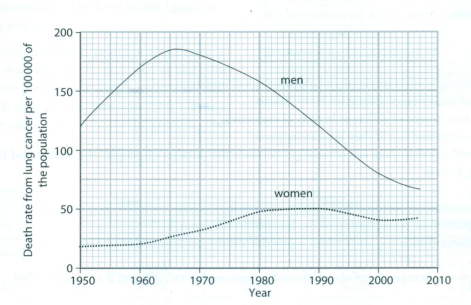 The figure shows the numbers of deaths from lung cancer of men and women aged between 35 and 69 in the UK between 1950 and 2007.
b i Explain the advantage of calculating death rates as 'per 100000 of the population'. 8 Cardiovascular diseases such as coronary heart disease (CHD) and stroke are major causes of illness and death throughout the world. People diagnosed with these diseases often require expensi e treatments such as surgery or long-term drug treatment. of their total expenditure on health. So many toxicities(tar, carbon monoxide and nicotine) are included in the smoking, but why are there a lot of people still continuing to learn to do it?